Instructions: Layout is 12 x 12". Choose your paper from designer paper collection. Carefully tear paper following white border. Tear green paper to match previously torn paper. Ink the edges with Olive, Majestic Violet, and Deep Purple. Die cut 4 mats from the designer paper using Cut Mat Create 1A collection, ink edges using Majestic Violet, Deep Purple and Olive ink. Adhere onto purple background. Die cut photos using Cut Mat Create 1B dies. Using white cardstock die cut the smallest rectangle, the label strip, from each set. Die cut arrow from green designer paper. Die cut two daisy clusters, 2 leaf vines, daisy flourish, and arrow from white cardstock. Color the daisy flourish and leaf vines with Sunflower ink. Once colored, apply glue to sponge, sponge glue on all decorative die cuts, and apply Rajni Chawla's Crystal Clear, tap off and allow to dry. Stamp the pansy blossoms in Majestic Violet ink on white cardstock. Color using Sunflower, Forget-Me-Not, Deep Purple, and Majestic Violet ink using sponge daubers. Stamp leaves in Fern Green ink on white cardstock and color with Olive ink. Die cut with coordinating dies. Shape using Pansy Mold. Assembly pansy blossoms as shown. Adhere pieces as shown using both Dries Clear glue and foam adhesive. Adhere embellishments and flowers as shown. 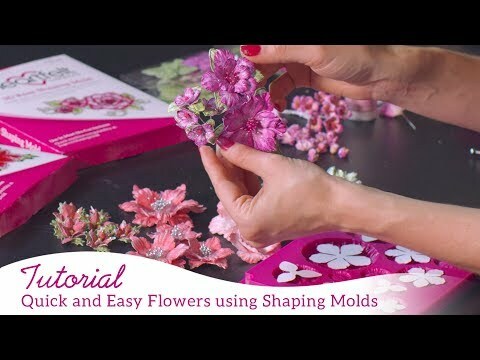 Add Dries Clear glue to flowers leaves, and floral paper as desired, apply Crystal Clear and tap off. Add Lemon Chiffon prills to the center of flowers.